This week, Red Tractor has challenged a variety of bloggers to bust out some of their favourite recipes using Red Tractor products. I thought I’d share with you a great, zesty turkey mince recipe that you can pop in a bento or lunch box, or cook for a main course or starter! Now we’re moving into autumn, the harvest season is finally here and all the hard work put in by British farmers is paying off. The Red Tractor scheme is one of the UK’s largest food standard schemes and the logo on your food ensures that the product has reached the standard set out for animal welfare, food safety, traceability, and environmental protection. Plus, it can be traced back to British farms! 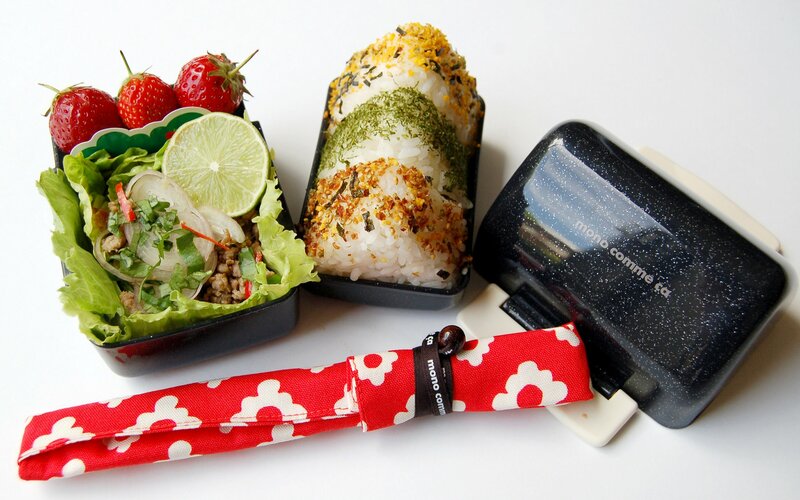 I picked up my turkey mince from Lidl’s Birchwood Farm range, and made a bento lunch by lining the lunchbox with lettuce, then adding in some onigiri (rice balls) and some strawberries for dessert. If you wanted to serve this for a dinner, simply separate out your little Gem lettuce leaves to create lettuce cups to hold the mince. This makes for great party food, too! Heat a little cooking oil in your pan and fry the ginger, garlic and half the chillies for one minute, or until they become fragrant. Add the mince and break it up as you cook, continuing to stir until it is slightly golden. Sprinkle over the sugar, and add the fish sauce, lime juice, the shredded lime leaves and the rest of the chilli, saving some for a garnish. Cook for a few minutes until the sugar has dissolved and has made a sticky sauce. The mince should be dry when finished. To serve, pour the mince into a bowl lined with lettuce leaves, topped with the shallots, coriander, lime slice and some reserved chillies. The post contains sponsored content.